It's no secret that the success and popularity of BNLL is due to the efforts of it's many volunteers. Every aspect of the league depends on individuals volunteering their time and talent without which there would be no league. If you are a parent of a new player, baseball enthusiast, or a member of the community looking to contribute, then we would invite you to consider volunteering. Some of the league's needs are season long while others are event specific requiring only a few hours investment. One of the big stories for the 2015 season is the construction of a new ball field that took place in the spring and summer of 2014. Located at the Newbury Elementary School, this project is the result of a collaboration between the league & the school district, generous donations by local area businesses, and the many volunteer hours of labor it took to construct the field. In the next few weeks you may expect to see the new field presented right here on our website. 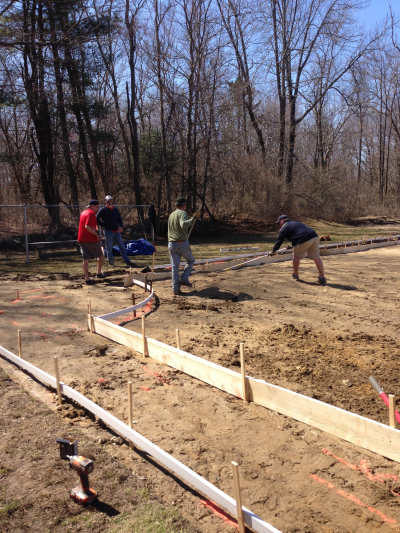 Below: Volunteers prepare the new field before field soil and clay are delivered.